In all cases the Bible text (as given in book used) must be read and narrated first. Old Testament History,* by T. M. Hardwick and E. Costley-White (Murray, 3/6), Vol. III., pp. 115-176. (a) S.P.C.K. Bible Atlas (1/-). (b) Historical Geography of the Holy Land, by S.R. Macphail (Clark, 1/-). (c) The Universal Bible Dictionary (R.T.S., 7/6), may be used for all names of persons and places. (d) The Saviour of the World, Vol. V. (P.N.E.U. Office, (1/-), pp. 128-192. (e) The Acts,* by E. M. Knox, pp. 267-324 (Macmillan, (3/6). (f) The Prayer Book in the Church, by the Rev. W. H. Campbell (Longmans, 3/-), pp. 1-14, with lesson on The Trinity. The Quest of Nations, by T. R. W. Lunt (U.C.M.E., 2/6), pp. 61-119. The Story of S. Paul's Life and Letters, by J. Paterson Smyth (Sampson Low, 5/-), pp. 76-162. The Spanish Brothers (Nelson, 3/-), or Lysbeth, by Elder Haggard (Longmans, 6/-). For private daily Bible reading, Daily Readings from the Old Testament, by H. Franklin and L. Montagu (Williams & Norgate, 2/6). For New Testament, a Gospel in suitable portions. (b) A Boy's Book of Prayer, by A. Devine (Methneu, 2/-). Occupations: A Book of Centuries. Choose and write ? ?oes in beautiful lettering. Choose and transcribe passages from Shakespeare's Midsummer Night's Dream, and the other books set, in A New Handwriting for Teachers, by M. M. Bridges (P.N.E.U. Office, 5d. a card); work from card 6. Dictation. (A New Handwriting to be used). Two or three pages or a passage to be prepared first from a newspaper; or, from the prose and poetry set for reading; a paragraph to be then dictated or to be occasionally written from memory. Read on Tuesdays some subject in "Literature," or, on the news of the week or, on some historical or allegorical subject, etc. Write on Thursdays a resume. Verses (note metre of poems set for this term), on current events and on characters in the term's reading, upon historical characters, or, on Spring scenes. Letters on family events and general news to friends. Parse and analyse from books read, making progress each term. Meiklejohn's A New Grammar of the English Tongue* (4/-), pp. 182-142: 175-185. The History of English Literature for Boys and Girls, by H. E. Marshall (Jack, 10/6), pp. 254-355. (a) Shakespeare's Midsummer Night's Dream* (Blackie, Plaintext, 7d.). Scott's Kenilworth* (Collins. 2/-). Bacon's Essays (Blackie, 1/-). Spenser's Fairie Queen, Book I., Canto I. (Oxford Press, 10d.). Palgrave's Golden Treasury* (Oxford Press, 2/6): Elizabethan Poets. Poems of To-Day* (Sidgwick & Jackson, 3/6). Make a chart of the 16th Century (1500-1600), (see reprint from P.R., July, 1910, 3d.). Read the daily news and keep a calendar of events. Gardiner's History of England* (Longmans, 6/6), Vol. II., pp. 428-501 (1558-1625). A History of Everyday Things in England, by H. & C. Quennell (Batsford, 3/-), Part IV., may be used for period. Medieval and Modern Times,* by T. R. Robinson (Ginn & Co., 10/6), pp. 331-351 (1558-1625). The Spanish Armada (Blackie, 6d.). Ancient Times: A History of the Early World,* by J. H. Breasted (Ginn, 10/6), pp. 74-139 (omit questions). Continue a Book of Centuries* (P.N.E.U. Office, 2/6), putting in illustrations from all history studied. The Story of the Great War, by D. A. Mackenzie (Blackie, 6/-), pp. 108-151 (optional). Ourselves,* Book I. (Kegan Paul, 4/6), pp. 187-210. North's Plutarch's Lives, edited by P. Giles (University Press, 8/6): Tiberius and Caius Gracchi. A Pronouncing Dictionary of Mythology and Antiquities* (Walker, 1/6), quite necessary. Citizenship,* by E. R. Worts (Hodder &Stoughton, 4/6), pp. 48-90 (narration instead of questions). The Ambleside Geography Books, Book V.* (5/1), pp. 1-62. Our Guardian Fleets in 1805,* by H. W. Household (Macmillan, 8/-), pp. 31-65. Eothen, by Kingslake (Dent, 2/6), (optional). Know something about foreign places coming into notice in the current newspapers. Ten minutes' exercise on the map of Europe every week. Philip's Atlas of Comparative Geography (new edition, 8/6), may be used. See also tests under "Scouting." Teacher to use The Treaty Settlement of Europe, by H. T. Fleure (for new frontiers), (Oxford Press, 2/6). Map questions to be answered from map and names put into blank map (from memory) before each lesson. Teacher may find useful Out-Door Geography, by H. Hatch (Blackie, 8/-). Winners in Life's Race,* by Mrs. Fisher (Macmillan, 6/-), pp. 314-353 (out of print), or, Every Boy's Book of Geology, by Trueman and Westell (R.T.S., 6/-), pp. 15-86. Elementary Studies in Plant Life,* by F. E. Fritsch (Bell, 8/6), pp. 91-96, 102-124, 181-187. Keep a Nature Note-Book (P.N.E.U. Office, interleaved, 2/6), with flower and bird lists, and make daily notes. For outdoor work take some special study, from Furneaux's A Nature Study Guide (Longmans, 6/6), The Changing Year, by F. M. Haines (Wadsworth, 8/-), or Countryside Rambles, by W. S. Furneaux (Philip, 2/6): April to July. First Year of Scientific Knowledge,* by Paul Bert (Rolfe, ?/-), pp. 234-278. Some Wonders of Matter,* by Bishop Mercer (S.P.C.K., 5/-), pp. 34-63. Hygiene and Physiology, Domestic Economy. A Health Reader,* by W. H. Abrahall (Cassell, 3/-), pp. 55-109. Pendlebury's New Shilling Arithmetic,* pp. 124-131 (Bell, 2/3). Revise back work; examples may be taken from Pendlebury's New Concrete Arithmetic, Book V. (Bell, 5d.). A School Geometry,* by H. Hall and F. Stevens (Macmillan, Parts i.-iv., 3/6), pp. 96-97, 99-101, 104-109, and revise 35-68, doing more exercises. The School Set of Mathematical Instruments (Macmillan, 2/1). A School Algebra,* by H. S. S. Hall, Part I. (Macmillan, 3/6), pp. 1-4, 6, 7, 18-19, 28, or continue. Perini's Italian Conversation Grammar* (Hachette, 6/6), Exercises 11-15, or, better, A New Italian Grammar, by E. Grillo (Blackie, 6/-), pp. 1-12, 175-180. Limen,* Part I. (Murray, 2/6), pages 1-4*, with corresponding exercises. Primary French Course,* Part II., by O. Siepmann (Macmillan, 8/-), Lessons 26-30 inclusive, with grammar and exercises. Teacher study preface. Read and narrate Moliere's Le Bourgeois Gentilhomme (Blackie, 1/-). Read several poems and learn one from Longer Poems for Recitation (Blackie, 6d.). The Fesole Club Papers,* by W. G. Collingwood (see current P.R.). Studies of trees. Illustrations of scenes from Literature. Study, describe (and draw from memory details of) six reproductions* of pictures by Corot (P.N.E.U. Office, 2/- the set). See the special notes in the Parents' Review, April, 1922. Paintbox with specially chosen paints and brush (P.N.E.U. Office, 5/-). 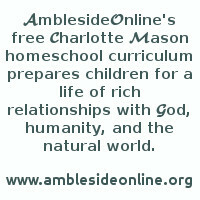 Learn two suitable passages of 20 verses each from chapters in Bible Lessons. Two hymns. Psalms 150, 72. Two poems from Poems of To-Day, or, a scene from A Midsummer Night's Dream. Books set under Literature, History, Geography, Recitations should afford exercise in careful reading and in composition. Poetry should be read daily. The Odysseys of Homer, Chapman's Translation (Simpkin Marshall, 3/6), Books 5-8 inclusive (to be read by teacher, with omissions). See Programme of Music (Grieg) Parent's Review, Parents' Review, April, 1922: Our Work. The Listener's Guide to Music, by P. Solioles (Oxford Press, 4/-), may be used. Singing. See Programme of Music. Three French songs, French Songs with Music (Blackie, 7d.). Three German songs, Deutscher Liedergarten (Curwen & Son, 2/6, or, without accompaniments, 6d.). Three English songs, from The National Song Book, edited by C. V. Stanford (Boosey & Co., words and voice parts 1/9 each,* complete with music 6/-). Ten Minutes' Lessons in Sight-Singing (Curwen, 2/6). Fifty Steps in Sight-Singing, by Arthur Somervell, steps 27-82 (Curwen & Son, 2/6). Ball Games and Breathing Exercises, by Alice R. James (Longmiurs, 1/9). For Drill Music, Music for use in Mrs. Wordsworth's Classes (P.N.E.U. Office, 3/6), may be used. Peasant Dances and Songs in Many Lands (Evans, 7/6). The Board of Education's Syllabus of Physical Exercises (Eyre & Spottiswoode, 1/6), tables 37-40. Ex-Students, House of Education Drills. How to Teach Dances (Evans, 4/6). Tennis. Do some definite house or garden work. Claymodelling, by H. Unwin (Longmans, 4/6). Heaton's Cardboard Modelling (Newman, 6/-): make six models. (Materials from Arnold & Son, Butterley Street, Hunslet, Leeds.) Simple Garments for Children, by Synge (Longman's, 7/6). Constructive and Decorative Stitchery, L.G. Foster (3/6): design and make a garment. Darn and mend garments from the wash each week: First Lessons in Darning and Mending (P.N.E.U. Office. 2d. ), may be used. Teacher will find useful What shall we make? By M. La Trobe Foster (C.M.S., 1/-). See also (unless working as Girl Guides) tests under Scouting (Parents' Review, May, 1920): all girls should the First Aid (No. 10) and Housecraft (No. 7) Tests. Make a garment for the "Save the Children Fund"; for particulars apply to 29 Golden Square, Regent Street, W. 1. N.B. 1.--Each pupil should have a copy of all books, etc., marked * and a set of the Pictures and materials. One copy of earlier books is sufficient. N.B. 2.--For methods of teaching the various subjects see House of Education, 5/6, School Education. 5/- (P.N.E.U. Office). In home schoolrooms, Forms III. And IV. may work together for memory subjects (including Scripture). N.B. 3.--All books, etc., may be obtained from the Secretary of the P.N.E.U., 20, Victoria Street, London, S.W. 1, as well as exercise books bearing the school motto (ruled singled, double lines and squares), 8 1/2d. each, and Cambridge paper for the Examination 2/6 for 4 quires (not less) ; envelopes to match 2/6 a packet. Also the School Badge (6/-), School Hat Band (4/6), and Ribbon 3/6 a yard. Badges stencilled in washing colours on pale blue linen may also be obtained, 4 1/2d. unmounted, 5d. mounted.